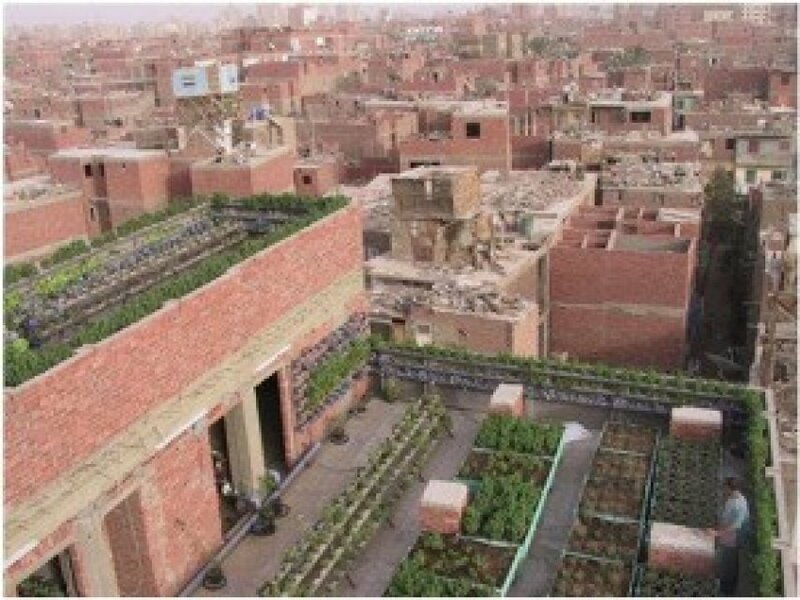 In informal settlements of the Greater Cairo Region, a rooftop farming project was initiated in 2014. The goal was to reduce ambient temperatures (microclimate) in a densely populated area through green spaces on rooftops, and reduce the impacts of the urban heat island effect and increasing heat due to climate change. In addition to the environmental benefits, rooftop farming has other socio-economic benefits, adding to income generation and reducing vulnerability to price hikes. As many challenges were faced affecting sustainability and continuation, a new project was developed to establish a social business model to strengthen the socio-economic aspects of the project, while looking at rooftop farming from a community development perspective. 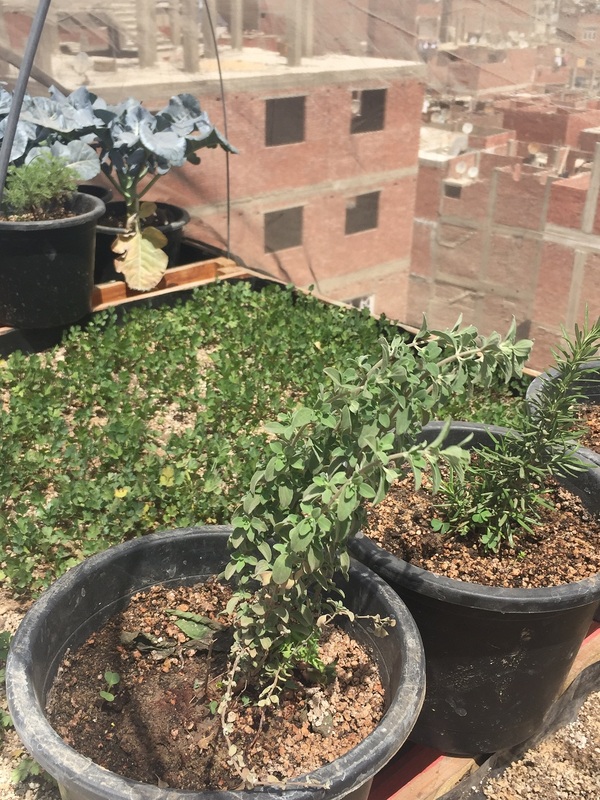 A Rooftop Farming Hub was established in two informal areas to act as a technical, socio-economic, and environmental driver for change within the participating community members. Adaptation Action Packages include •	Develop agro-economic systems and new structures to manage crops, fisheries and animal production, which are resilient to climate changes. •	Raise community awareness about climate change risks and means of adaptation. As socio-economic conditions in Cairo's informal settlements worsen with increasing climate vulnerabilities, adaptation measures should be linked to income generation. 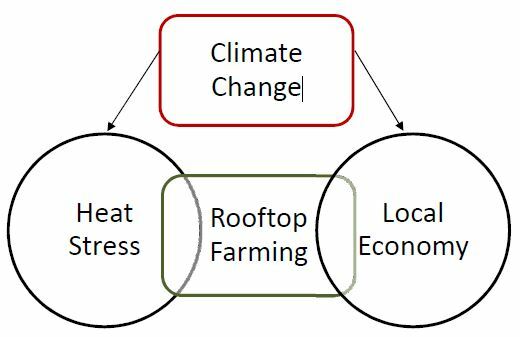 The recent price hikes and devaluation of the local currency presents an opportunity, as well as a challenge, where community members could be more motivated to grow their own foods to decrease their dependency on buying from the market, however it presents a great challenge as the cost of rooftop farming (initial, running, and maintenance costs) is greater than the profits generated from the sales of the produce. As the socio-economic conditions worsen, so does the break-even point for the success of this collective farming scheme. The lack of economic benefits threatens the project’s continuity. Poor infrastructure in these areas, access to clean water, affordability of nutrients, as well as harsh weather conditions, further threaten the growth of the rooftop farms. Aside from the technical implementation of rooftop farms (Building Block 1), the approach builds on the establishment of a social-business model ( Building Block 2), and the cooperation and knowledge sharing between different stakeholders (Building Block 3). The first building block addresses the challenge of finding the most effective techniques that are locally sensitive to the socio-economic conditions. Furthermore the structure of the project, the second building block, addresses the major challenge of sustainability of the project with its main pillars focusing on the technical, social, and economic sustainability of rooftop farming as a local practice. Without community collaboration and this collective approach to farming, third building block, rooftop farmers cannot yield the same gains, whether financial or social gains. It is therefore important to combine these 3 building blocks together. Environmental impacts: The green roofs improve the microclimate by contributing to the reduction of temperature inside and outside the buildings, thus providing a cooling effect and increased natural ventilation. Social impacts: Through the RTF Hub, a rooftop farmers network was established within the participating community members, where social support was given, challenges were shared, concerns were communicated, and ideas were developed to help strengthen each farm collectively. Exchange sessions are set up regularly to enhance communication betwen the RTF farmers. With the support of the Hub, participating members were able to keep a portion of the crops for personal use, thus making people less vulnerable to price hikes. Rooftop farms further provided a new recreational space for families and children. Economic impacts: The Hub functioned as a linkeage to the local market. A marketing plan was set up sensitive to the local community. While participating members kept a portion of their crops for personal use, a larger portion was collected by the Hub from all rooftops to be sold in the market. The proceeds were then shared with the farmers, as well as used to finance nutrients and maintenance of the farms. Income generation is therefore and opportunity as this scheme grows. Neama is the head of the NGO "Serious Work" and was selected to be trained along with some staff members to act as a Rooftop Farming Hub, a social-business model that aims to support the establishment of rooftop farms in their community through a sustainable development approach. While she was hesitant that she would be able to play this role, after extensive trainings and capacity development programmes, and after supporting around 15 households to set up their rooftop farms, she is now an expert in her community and has become increasingly engaged in environmental projects from rooftop farming to community gardens. Seeing not only her own entity's rooftop grow, but also community members roofs turning green has inspired her to conduct her own research on different solutions and to become a crucial advocator for rooftop farming and its impacts on urban communities suffering from urban heat island effect in her community, as well as to other NGOs in the area. As her passion for growing this social-business grows, a number of NGOs have approached her to receive trainings from her group to help spread the idea and practice in other communities around the Greater Cairo Region.